Welcome to Cheap Oahu Car Rental located on the beautiful Island of Oahu - Save money and rent a car through us! Going to Hawaii? Fun? Sun? Sightseeing? Let Cheap Oahu Car Rental provide economical transportation for your dream trip. We promise to keep it simple. Serch for and lock-in rates our use our classic no-obligation reservation form. You'll love our quality vehicles and affordable rates at the Honolulu Airport. As you complete our no-obligation form, select "Cheapest Rate" to receive the best rates and benefits our affiliates in the car rental industry can offer you. You'll be happy to see there are no deposits required, and we won't ask you for your personal credit card information. Payment details are taken care of when you pick-up your car. In addition, if you change your mind about renting from us, you'll never be charged any cancellation service fees. Unlike the large popular online travel agencies we have all become familiar with. We recommend you book early for best selection and savings opportunities. 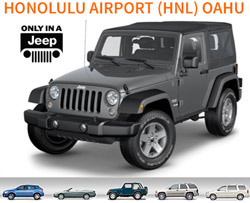 Use our partner OahuJeeps.com if you would like to rent a Jeep Wrangler in Honolulu or Waikiki. Cheap Oahu Car Rental accepts reservations from where you are. Our cars are for hire and reservations are accepted from most locations around the world. We do not require payment ahead of time and you can cancel your reservation without being penalized.